Jeep has always been good for showing off its designers’ talents with a slew of concept vehicles every year, and 2015 will be no different. Headed for the Geneva Motor Show floor is the Hard Steel concept – a bare-body Renegade fitted with tons of custom work, Mopar parts, and its own little mini-me trailer. It’s hard to deny the coolness (and cuteness) of this ‘ute and its tag-along friend, especially when considering all the one-off design elements found hovering over all six wheels. The bodywork is perhaps the most eye-catching aspect of the pair. Looking something like the DMC DeLorean, the brushed bare metal look really adds some character. A nice suspension lift and upgraded tire package increase the Renegade’s off-road abilities while a skidplate engraved with “Trailhawk” protects all the vital greasy bits. Of course, there’s plenty to tell about that Renegade rear end trailer. It houses a host of technology and a massive flatscreen TV for tailgating. During the Geneva show, it will showcase Jeep’s Uconnect Live system, complete with all the current streaming audio and navigation systems. The outside of the Renegade Hard Steel concept is a large departure from anything normally seen on today’s concept vehicles. Harking back to the famed DMC DeLorean, the body is finished with a brushed metal look. Jeep calls it brushed steel, so we hope it’s either got a nice thick layer of clear coat or Jeep replaced with body panels with stainless steel, otherwise the concept would be a rusted pile of junk in short order. Besides the finish, Jeep has added hood vents similar to those found on select Wrangler models, along with an extra bump in ground clearance. The matte black, 16-inch wheels are then wrapped in meaty BF Goodrich All Terrain T/A tires for a more menacing stance. A thick skidplate lurks under the front bumper with the “Trailhawk” name etched out. Speaking of matte black, Jeep coated much of the Renegade’s trim pieces in the color, including the front grille, mirror caps, running boards, and trailer hitch. The interior has also undergone a vast transformation. The same brushed-steel look is found on the HVAC vents, center console, glove comportment, and speaker surrounds. The seats have been recovered in a Frau Century leather and are finished in a lead-colored hue. The stitching matches the lighter brushed steel look for a nice contrast. That stitching continues in the door panels, along with the seat headrests with the Trailhawk logo embroidered. 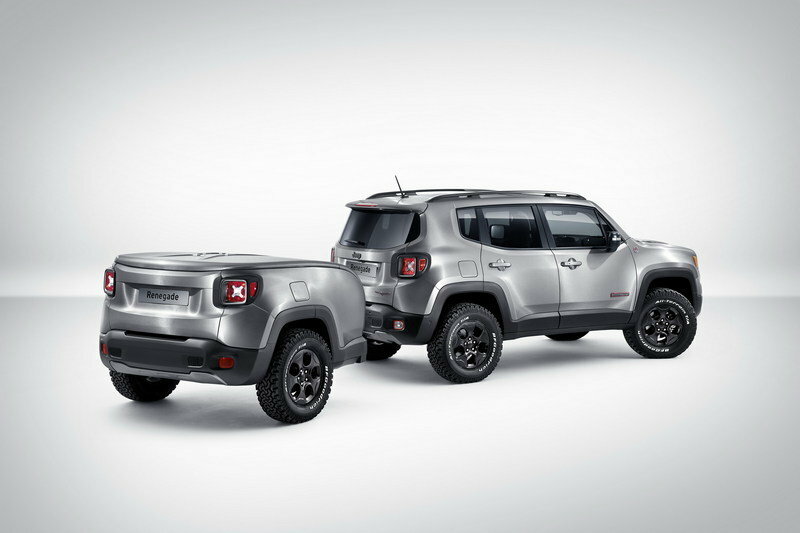 Perhaps the biggest deal with this Renegade concept is its look-alike trailer. It features the same exterior coating, wheels, tires, and even fuel filler door as its tow vehicle. The trailer plays hosts to a bevy of tech equipment Jeep is showing off at Geneva. A massive touch screen display shows what the new Uconnect 5-inch and 6.5-inch infotainment screens show, allowing show-goers to see the new systems in action. A bank of speakers ensures audience members can hear what’s going on as well. The upgraded software includes Deezer internet music, TuneIn internet radio, Reuters news, Tom Tom LIVE real-time traffic, along with Facebook and Twitter access. Jeep has likely kept all the drivetrain components stock, meaning this Renegade is powered by one of its 16 powertrain combinations – yes, 16 combinations. 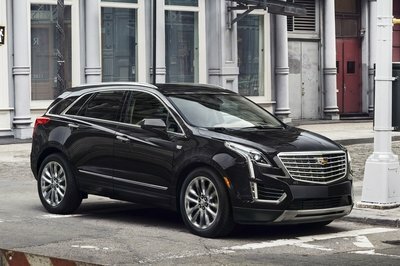 They include four MultiAir gas options, two MultiJet II diesel options, the flex-fuel capable E.torQ engine, and a host of transmission options that include the nine-speed automatic, two manual options, and a dual-dry clutch option. Now of course, which powertrain option is available is limited by region, meaning all the choices aren’t available everywhere. 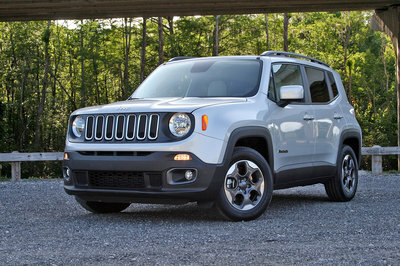 In the U.S., the Renegade is only offered with the 1.4-liter, turbocharged, gasoline four-cylinder and the 2.4-liter MultiAir Tiger Shark four-cylinder. The 1.4-liter produces 160 horsepower and 170 pound-feet of torque while the larger 2.4-liter produces 184 horses and 177 pound-feet of torque. There’s really no telling how much money Jeep put into this concept, though we do know that a standard Renegade in Trailhawk trim starts at $25,995. Add to that all the custom work and the trailer, and it’s easily assumed this one-off design cost more than $80,000. 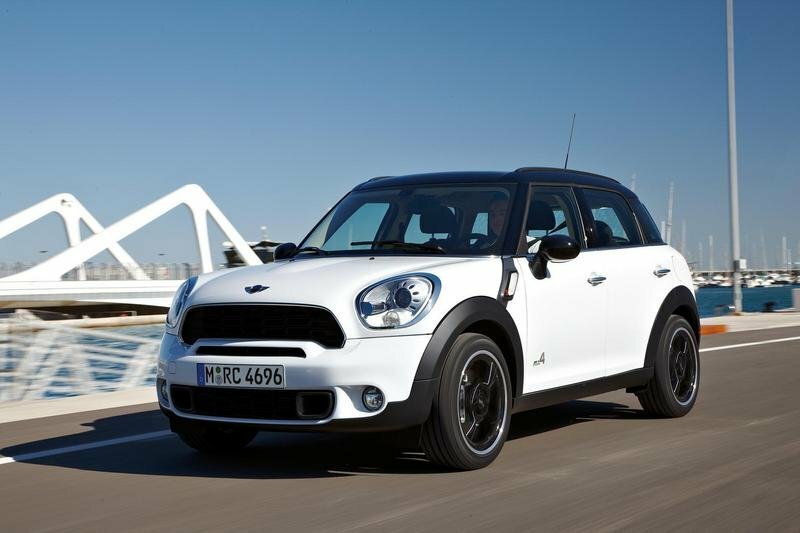 The Mini Countryman is a comparable cute ‘ute that has a ton of character and not much off-roading abilities. Though even the stock Trailhawk Renegade is more capable in the dirt that many give it credit for, the Mini and its AWD system is more relegated to foul weather situations. The Contryman comes in two versions: the standard and S models. 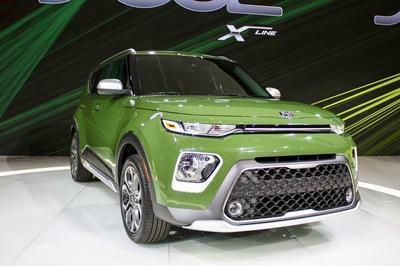 The base is powered by a 1.6-liter four-cylinder with 122 horsepower while the sportier S model comes with a turbocharged version of the 1.6-liter making 184 horsepower. 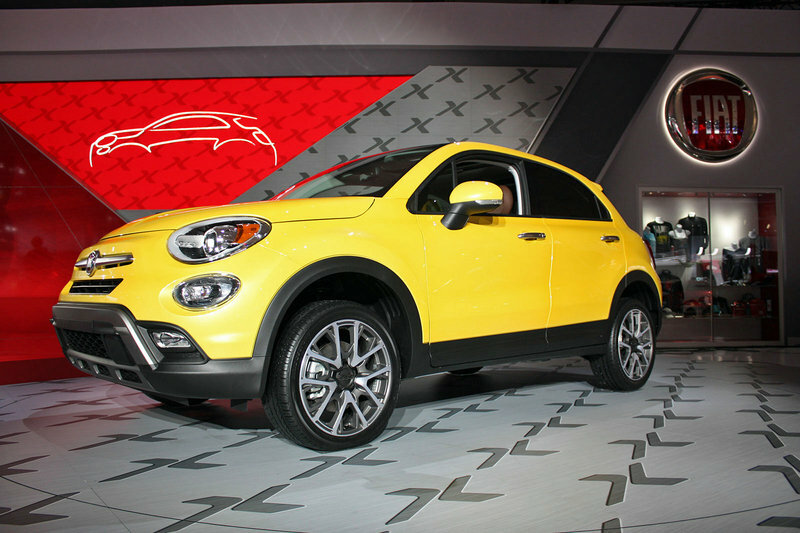 The Fiat 500X is the Jeep’s closest competitor mostly because they share the same platform. Much of the same architecture lives under the two separate body designs, giving the Fiat a upper hand. 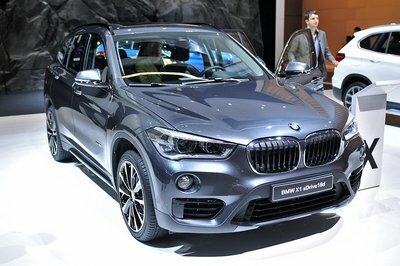 Power comes form the same lineup of engines as well, including the 1.4-liter gasoline engine and 1.3-liter turbodiesel. 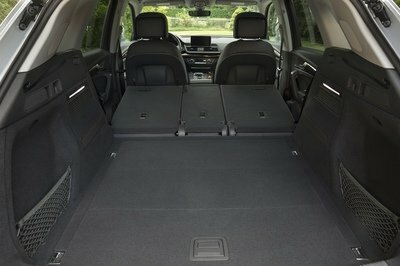 Of course, the same all-wheel-drive system found in the Jeep will be offered here as well. The 500X is due out for 2016 and is slated to be a global vehicle like the Renegade. 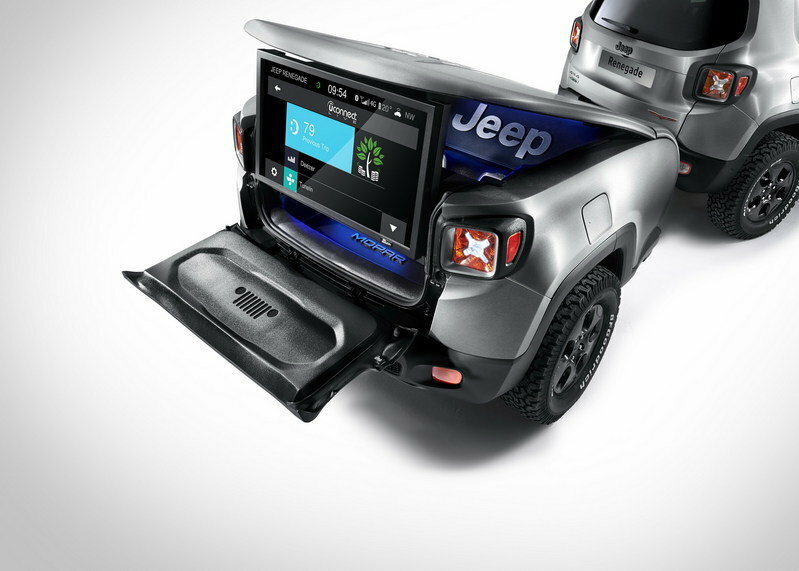 This concept is one of the more fun we’ve seen Jeep release of the new Renegade. It’s cool body finish, lifted suspension, beefy tires, skidplate, and interior updates – not to mention the awesome trailer, really make it a bespoke vehicle. Don’t count on seeing this Hard Steel concept make it to production, but you can certainly count on all the upgraded technology finding its way into the Renegade’s dashboard. It’s also a possibility the suspension lift may someday be offered through Mopar as a dealer upgrade. The Renegade Hard Steel Jeep showcar, which blends style, off-road vocation, and technology, will be making its debut and the 2015 Geneva International Motor Show. 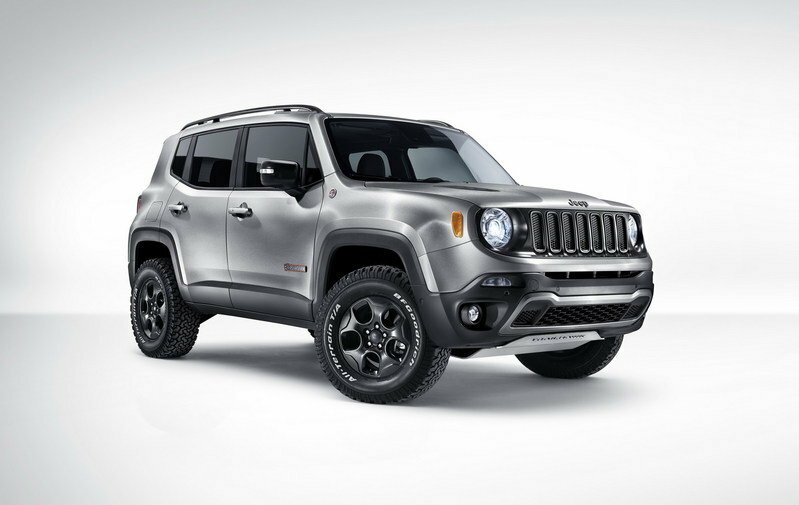 Created by the Jeep brand, in collaboration with the Mopar brand and backed by the FCA Style Centre, the showcar "explores" the potential of a model that provides countless customization options, while also providing an outlook for potential future Mopar accessories dedicated to the new Renegade. Based on the Trailhawk - the off-road version of the range - the prototype is not a simple customisation in aftermarket but a design project that, with due respect to the peculiarities of original models, has led us to the creation of a unique and fascinating article. The "technological" aspect of the showcar is attained aesthetically with a Brushed Steel livery, a bodywork treatment that evokes cutting-edge aviation and marine technology. All enhanced by a matte black colour contrast used for many of the features such as the grid, roof bars, mirror covers, 16" alloy wheels, side rubbing strips, bonnet air vents, fenders and bumpers. The same strong customization is found in the interior where the Brushed Steel treatment embellishes the frames of the air conditioning vents, gearbox, glove compartment and audio speakers. Stylistic details that go perfectly with the light grey tone stitching of the seats, the door panels and the Trailhawk logo embroidered on the headrests. Special mention goes to the Renegade Hard Steel upholstery proposed in a precious Frau® Century lead-coloured leather: an absolute novelty in the automotive field. In particular, the high-quality coating, designed to celebrate the brand’s 1912 centenary, has been accomplished through a long and intricate craftsmanship. The final result provides a soft and warm touch, along with a worn look of great exquisiteness: small but perceptible changes in the nuances of texture that uniquely line each piece. Metropolitan appearance for a model that is no stranger to the most extreme escapades. The Renegade Hard Steel showcar adopts larger BF Goodrich All Terrain tyres, raised suspension, skid plate engraved with "Trailhawk" and bonnet performance. Made all the more attractive by the presence of original accessories such as a Mopar grille and opaque black mirror covers, black running board, floor mats and towbar. The latter is connected to the trailer that incorporates the vehicle "vitamin-enriched" design and becomes an "internet hotspot" thanks to the Wi-Fi developed by Mopar, always as an original accessory dedicated to the Renegade. Within the trailer, a touch screen display shows all the features of the new Uconnect® LIVE system, a service platform that allows access to Internet Music (Deezer), Internet Radio (TuneIn), News (Reuters), real time Traffic (Tom Tom LIVE) as well as Social Network (Facebook and Twitter). Available from June on Renegade model - it is the first Jeep vehicle to provide this - the sophisticated infotainment system adopts UconnectTM 5 "or 6.5" touch screens ensuring access to radio, mediaplayer, handsfree phone, navigation device and UconnectTM LIVE services. Finally, the original "appendage" of the Renegade Hard Steel showcar is provided with speakers that make it a real "entertainment station": through the collaboration of Jeep and Deezer, in Geneva the public can preview the Renegade Playlist, 25 music tracks that evoke the true spirit of the strongly suggestive unconventional and adventurous new Jeep model.